Copyright Notice: TM & © 2018 Cartoon Network. These are the official Ben 10 - Ben Tennyson licensed characters, Ben 10 - Ben Tennyson. We take care of everything; our full service includes the copyrighted character costume, trained performer and Road Manager (minder) to accompany the character. Please visit our character events page to find out more. Our licensed character costumes are not available to hire on a costume-only basis. Characters are booked at a single day or an overnight rate, depending on event location, rather than for shorter time periods. Our aim is to bring these famous characters to life to create a magical experience for children when they meet the characters. Ben Tennyson is the main character of the popular Ben 10 TV series. He was a normal ten-year-old boy until he found the Omnitrix, a powerful watch-like device that allows him to turn into ten different aliens. Ben uses the Omnitrix to stop evil, but that doesn’t stop him from using it for his own personal needs. The all-new series of Ben 10 aired on Cartoon Network in October 2016 and received hit ratings. The original Ben 10 TV series premiered in 2006, followed by Ben 10 Alien Force (2009), Ben 10 Ultimate Alien (2010) and Ben 10 Omniverse (2012). The Ben 10 franchise has won three Emmy Awards. There are also four Ben 10 movies: Secret of the Omnitrix (2007), Race Against Time (2007), Alien Swarm (2009) and Destroy All Aliens (2012). When 10-year-old Ben Tennyson discovers the Omnitrix, he gains the power to transform into 10 different aliens, each with awesome powers. Ben uses these powers to help others and stop the bad guys, but also enjoys a little super powered mischief now and then. 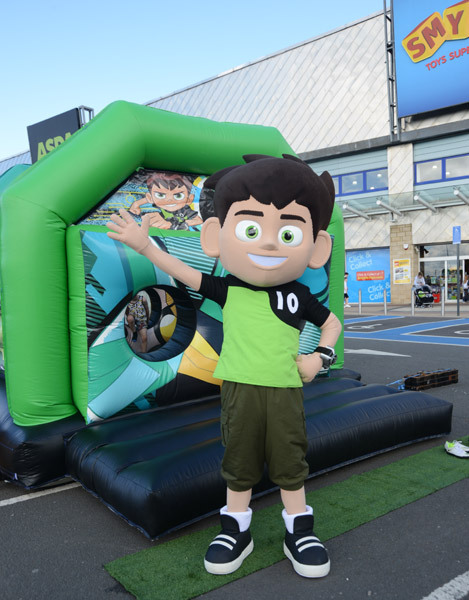 Ben Tennyson is available to attend UK events.